For almost 200 years the modern bicycle has been a popular form of transportation and recreation. Since Baron Karl von Drais introduced the bike forerunner the “dandy horse” (or Draisienne) to a curious public in 1817, the vehicle has only grown in popularity. For some it became the inspiration for writing a song, and from the 19th century until now songs about bicycles continue to enter the pop culture stratosphere. 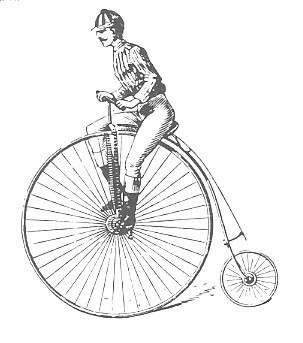 For Bike Month let’s take a quick look back at two centuries of songs about bicycles! Written in 1892 by Henry Dacre, “Daisy Bell” was a big hit in its time and continues to be reinterpreted to this day. With its popular chorus “Daisy, Daisy / Give me your answer do. / I’m half crazy / all for the love of you” the song has been covered by artists as diverse as Dinah Shore, Blur, and in 1961 an IBM 704 (more on that in a second). 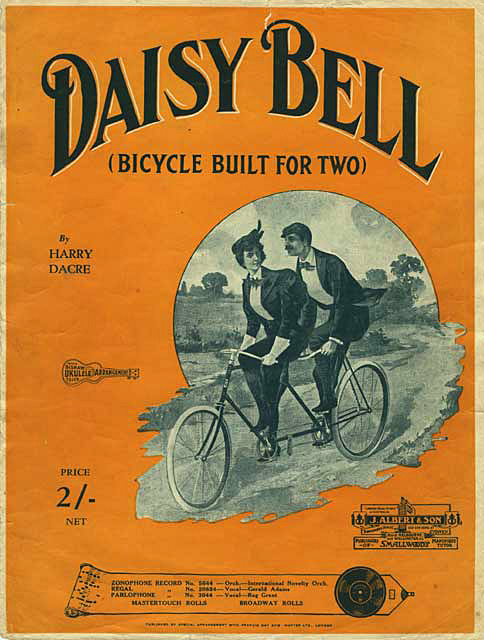 As implied in the title parenthetical the song is about a couple (one named Daisy) riding a bicycle made for two. Apparently Dacre was inspired to write it after immigrating to America from England. He was charged for bringing his bicycle in, which led to one of his songwriting friends joking “It’s lucky you didn’t bring a bicycle built for two, otherwise you’d have to pay double duty.” Dacre loved the phrase “bicycle built for two” so much it became the inspiration for this song. In 1961 computer research and development company Bell Labs programmed an IBM 704 to sing the song as a demonstration of computer speech synthesis. This led to the song being featured in 2001: A Space Odyssey in the memorable scene where malfunctioning computer HAL is breaking down and singing it before permanently going offline. This song has had a long lasting reputation with many different versions and covers, and a recently released concept album by Mark Ryden called The Gay Nineties Old Tyme Music: Daisy Bell features versions of the song by a variety of contemporary musicians like Nick Cave, “Weird” Al Yankovic, Katy Perry, Tyler The Creator, and Danny Elfman. 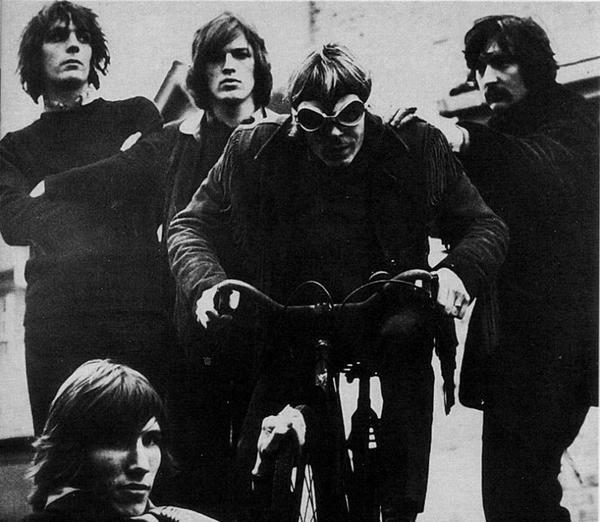 In 1967 Pink Floyd released The Pipers at The Gates of Dawn, their only full-length album performed entirely with original vocalist/guitarist/songwriter Syd Barrett, before Barrett had to leave the group due to a mental breakdown. This track closes out the album, and it is very much a product of the fractured mind of Barrett. An avid bicyclist, Barrett’s lyrics jump around on a variety of topics. Generally these topics are psychedelic and revolve around his bike, a girl that he’s showing it to, some gingerbread men, and a homeless mouse named Gerald. It’s an odd little number that closes out the first album of one the biggest rock bands ever. 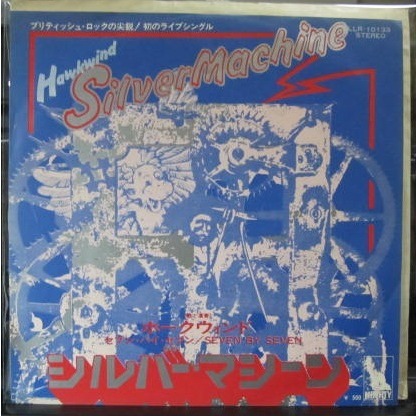 A UK hit in 1972 by the psychedelic hard rock band Hawkwind, “Silver Machine” is about vocalist Robert Calvert’s silver bicycle. It is notable for being an awesome tune, but also for the lead vocals on the studio version being sung by Ian “Lemmy” Kimister, future bandleader of British metal gods Motorhead. A 1978 single by British rock legends Queen, “Bicycle Race” was written by Freddie Mercury and inspired by his witnessing the Tour de France passing by the studio where they were recording the album Jazz. The song charted internationally and became infamous for its music video featuring 65 naked women racing on bicycles around Wimbledon Greyhound Stadium. We here at ParksByNature encourage all cyclists to wear protective gear when bike riding! “Bicycle Race” was later sampled by singer-songwriter Skylar Grey on her 2012 single “C’mon Let Me Ride”, a track that also features Eminem on guest vocals. 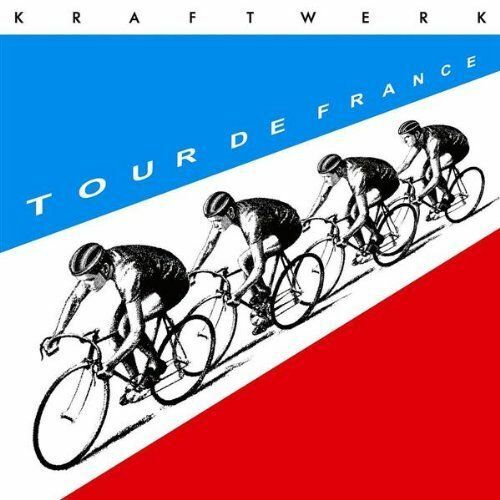 As mentioned in a previous and recent ParksByNature article, the German electronic group Kraftwerk released the single “Tour de France” in 1983. The group consists of avid cyclists wo wished to write something about the race. In 2003 they produced the cycling concept album Tour de France Soundtracks in honor of the centenary of the race. A single released by Jamaican artist Junior Reid in 1986, “Poor Man Transportation” is a song about riding a bicycle instead of a cab or a minivan due to the financial situation of the subject of the song. Reid was the vocalist in legendary reggae group Black Uhuru. A 2009 track by Annie Clark aka St. Vincent, “Bicycle” is a digitally-exclusive track from her album Actor. The lyrics are simple and are possibly about Ms. Clark herself having to walk 26 blocks in the rain after her bike is stolen. It is a fine example of the bicycle used as a lyrical device, and a sad reminder of the reality of bike theft. There are many more great songs about bicycles that span hundreds of years and many genres. From The Beach Boys to Tyler The Creator, many musicians have been inspired by the bicycle to create songs that stand the test of time. We here at ParksByNature hope you feel inspired to find some time away from your computer today and take your bike out for a spin in honor of Bike Month. As always you can download the Pocket Ranger® app here if you’d like to know where the nearest state park is to ride your bike in!